Betty Anderson receives Mass Wildlife’s Sargent Award on September 10, 2007. Photograph by W. Petersen. Betty, as she was known among her friends and colleagues, originally hailed from Montana, the state she often considered her “real home.” Regardless, she spent most of her adult life living with her beloved husband, Paul, and raising two children in Carver and East Middleboro. In the 65 years she lived at Wolf Trap Hill Farm, Middleboro, Betty “kept track of every living critter [she] could identify…not just birds but also mammals, amphibians, reptiles, insects, and plants.” (Bird Observer, February 2016). Her love and stewardship of the natural world radiated outward from the farm to the rest of Massachusetts as she taught and advocated on behalf of the environment, inspiring other people in all of her endeavors. Here I have to disagree. Betty Anderson gave so much of her knowledge, her friendship, and herself to so many people for so many years, that her greatest legacy will forever be her love of other people and her own incalculable ability to enthuse, enlighten, educate, and motivate others to become the best that they can be. And I’m confident that there are legions of ornithologists and conservationists throughout the country who learned from what she produced, which will long withstand the test of time. Always curious and ever-intrepid, Betty began her professional ornithological career in 1957, working with the Massachusetts Department of Public Health’s Encephalitis Field Station in Lakeville, whereshe was employed trapping, banding, and bleeding birds in cedar swamps in Raynham as part of early research on Eastern Equine Encephalitis. When her two children were young, Betty became a Mass Audubon teacher where weekly she introduced hundreds of young children to birds and natural history in school systems in southeastern Massachusetts. By the 1960s, Betty’s enthusiasm for research and birdbanding led to her establishment of an Operation Recovery banding station on Duxbury Beach. Betty’s active involvement with this cooperative banding project—coordinated by Chandler Robbins, James Baird, and other active banders of the day—and her long-standing friendship with John and Rosalie Fiske—whose summer home was in Manomet—ultimately led to the establishment of the Manomet Bird Observatory (now called Manomet, Inc.). She was the founding director from 1969–1983. As Betty’s reputation and expertise in conservation-related activities broadened, her influence and experience similarly grew. In 1973, she became a founding trustee of the Plymouth County Wildlands Trust (now the Wildlands Trust). From 1981–2018, she began a continuous run as a member and eventually chair of the Massachusetts Natural Heritage and Endangered Species Program’s Advisory Committee. 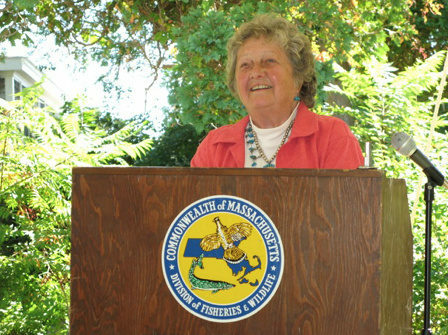 Betty received the prestigious Governor Francis W. Sargent Award from the Massachusetts Division of Fisheries and Wildlife in 2007. While her many honors and tributes are legend, several of the most notable are: being among the first women elected to membership in the Nuttall Ornithological Club in 1974 and being one of only two women to serve as president of that Club in 1987; receiving the Cornell Lab of Ornithology’s Arthur A. Allen Award in 1984; being elected a Fellow of the American Ornithologists’ Union in 2005; and her service on the boards of Mass Audubon, Hawk Mountain Sanctuary, the New England Wildflower Society, the North American Loon Fund, and the American Birding Association. The beacon that was Betty’s life for me was a brilliant beam that significantly shaped my life and career. May her rich legacy live on forever, and the lessons that she taught me always remain a beacon for others to follow. This entry was posted in History and tagged Betty Anderson, Kathleen Anderson, Obituary on November 7, 2018 by Wayne Petersen.